"We live on a placid island of ignorance in the midst of black seas of infinity, and it was not meant that we should voyage far. The sciences, each straining in its own direction, have hitherto harmed us little; but some day the piecing together or dissociated knowledge will open up such terrifying vistas of reality, and bof our frightful position therein, that we shall either go mad from the revelation or flee from the deadly light into the peace and safety of a new dark age." So said HP Lovecraft in the first chapter of his most famous story, The Call of Cthulhu (1926). This is also the perfect introduction to Steampunk Cthulhu, for within these stories mankind has indeed voyaged too far, and scientific innovations have opened terrifying vistas of reality, with insanity and worse as the only reward. The Steampunk genre has always incorporated elements of science fiction, fantasy, horror and alternative history, and certainly the Cthulhu Mythos has not been a stranger to Steampunk. 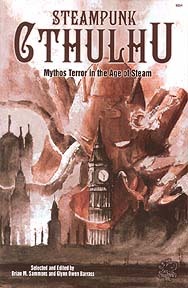 But until now there has never been a Steampunk Cthulhu Collection, so here are 18 tales unbound from the tethers of mere airships, goggles, clockwork, and tightly bound corsets; stories of horror, sci-fi, fantasy and alternative realities tainted with the Lovercraftian and the Cthulhu Mythos. Here you will discover Victorian Britain, the Wild West era United States, and many other varied locations filled with anachronistic and sometimes alien technology, airships, submersibles and Babbage engines. But the Victorian era here is not only one of innovation and exploration, but of destruction and dread.